Lehmann Maupin is pleased to announce its representation of Cecilia Vicuña. The multidisciplinary Chilean artist’s work addresses critical issues of the modern era—ecological destruction, feminism, human rights, and cultural homogenization—through her genre-bending projects uniting poetry, performance, painting, and site-specific installations that span more than 40 years. Vicuña lives and works in New York and Chile. Vicuña’s inaugural exhibition with the gallery will open May 19 at 536 West 22nd Street. A joint project with the artist is planned for the Brooklyn Museum and the Museum of Fine Arts, Boston, in the spring and fall of 2018. “We are incredibly honored to represent Cecilia Vicuña. She is a natural fit, joining our program of artists who have worked to rewrite historical inaccuracies, expose the continued effect and violence of colonization, and visualize the bodies of those who have been systematically erased or ignored over the course of time. She is a prolific artist of singular vision, and we look forward to contextualizing her within the larger canon, where her contributions have been seminal, yet underassessed,” states Lehmann Maupin founder, Rachel Lehmann. Vicuña’s visual practice is deeply connected to and often originates from her poetry. The lyricism of her writing is evident in the multidimensional realms she constructs from suspended or draped unspun raw wool, sometimes dyed in vibrant colors, which are commonly described as visual poetry. 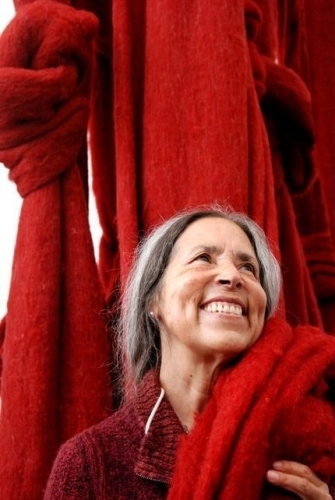 Vicuña herself refers to some of her best-known work as “QUIPOems”: a portmanteau of poem and quipu (khipu), the pre-Columbian system of tied knots used by Andean cultures for record keeping and communication. Vicuña’s work is characterized by a desire to preserve and pay tribute to the indigenous culture of the Americas, and often addresses the fragility of these communities. While living in Chile during the mid-1960s, Vicuña began an ongoing series of small sculptures she calls precarios, spatial poems in which she combines feathers, stone, plastic, wood, wire, shells, cloth, and other human-made detritus. These works are defined by their fragility and ephemerality, and are loosely fastened together with string, so the materials appear to have gathered naturally. Vicuña initially composed precarios along the ocean’s edge, so that they would inevitably be erased by the high tide. During the 1970s, amid a violent coup d’etat in Chile, Vicuña turned her focus to the similarly bloody era of the Spanish conquerors, supplanting images of Catholic saints with those of revolutionary leaders in figurative paintings, including Karl Marx (1972). Vicuña is also widely known for her performances and participatory interventions, which are designed to “bridge the gap between art and life, the ancestral and the avant-garde,” such as her performance of Paracas (2008) at the Brooklyn Museum, where her eponymous film, referencing the ancient Andean culture, was projected over the artist and a textile background. Cecilia Vicuña (b. 1948 in Santiago, Chile; lives and works in New York and Santiago). Vicuña received her MFA from the National School of Fine Arts, University of Chile in 1971 and continued with postgraduate studies at Slade School of Fine Art, University College London, from 1972-1973. Solo exhibitions of her work have been organized at Contemporary Arts Center, New Orleans (2017); Museo de la Memoria y los Derechos Humanos, Santiago, Chile (2014); Museo Nacional de Bellas Artes, Santiago, Chile (2014); FRAC Lorraine, Metz, France (2013); Institute for Women and Art, Rutgers University, New Brunswick, NJ (2009); The Drawing Center, New York (2002); and the Boulder Museum of Contemporary Art, Boulder, CO (2002). Group exhibitions and biennials featuring her work include Documenta 14, Athens, Greece and Kassel, Germany (2017); Radical Women: Latin American Art 1960-1985, Hammer Museum, Los Angeles (2017); 18th Biennale of Sydney, Australia (2012); DANCE / DRAW, the Institute of Contemporary Art, Boston (2011); ONLINE, Drawing Through the Twentieth Century, Museum of Modern Art, New York (2010); WACK! Art and the Feminist Revolution, the Museum of Contemporary Art, Los Angeles (2007); 12th Whitney Biennial, Whitney Museum of American Art, New York (1997); and INside the VISIBLE curated by Catherine M. de Zegher, at the Institute of Contemporary Art, Boston, which traveled to the National Museum of Women in the Arts, Washington, DC, the Whitechapel Art Gallery, London and the Art Gallery of Western Australia, Perth (1996). Her work is in numerous international private and public collections, including the Guggenheim Museum, Tate Gallery, London; FRAC Lorraine, Metz, France; Museo de Arte Contemporáneo, Santiago, Chile; Museo Nacional de Bellas Artes, Santiago, Chile; UC Berkeley Art Museum and Pacific Film Archive, Berkeley, CA; and the Blanton Museum of Art at The University of Texas at Austin, TX. Vicuña is the author of 20 volumes of art and poetry published in the U.S., Europe, and Latin America. Her filmography includes documentaries, animation, and visual poems. Vicuña has received several awards, including The Anonymous Was a Woman Award, New York (1999); and The Andy Warhol Foundation Award (1997), and in 2015 was appointed the messenger lecturer at Cornell University.